Elijah Wood is at it yet again, putting up a solid performance as the feeble and weak minded little man who ultimately comes out victorious in the dramatic thriller, Grand Piano. Filled with a star-studded, albeit shortlisted cast, the 2013 film delivers excellently paced drama, a chilling voice-over throughout the film by John Cusack, and tension that is palpable throughout. 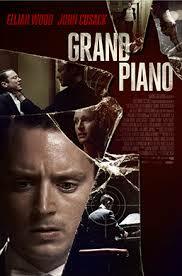 The plot of Grand Piano is relatively simple. Tom Selznick (Wood) is a piano prodigy, playing some of the hardest written pieces with the greatest of ease. However, during his last performance five years ago, Selznick's stage fright forced him to mess up the last four bars of his final act. He went into hiding afterwards, embarrassed by his faults. Selznick's actress wife, Emma (Kerry Bishe), arranges his comeback to a full house in New York. In the crowd is an angered fan and criminal, Clem (Cusack). Clem is somehow related to and/or is a friend of a well respected and known former pianist whose piano Selznick is playing. Inside the piano is a key that will lead Clem to fortune...or so he thinks. As Selznick nervously plays through the first few pieces, he is suddenly placed into a dangerous position as there are threatening notes written on his sheet music, accompanied by a red dot that seems to have him lined up. Selznick panics and is later thrown into the ultimate game of "Simon Says". Throughout the film, lives are lost during Selznick's flawless performances. He is running around like mad, attempting to save his wife, his friends, but more importantly to Selznick, his career. Grand Piano is a film that will leave the audience on the edge of their seats with brilliant acting, excellent directing by Eugenio Mira, and phenomenal music to amplify the importance of the performance. As the end that leaves much to be desired, you'll certainly be begging for an encore.